← Training Plan: Run… a lot! I hurried to sign-up for the 10km run before the “early bird” offer ended. I was quite excited about running my first race. I was never an athlete but I played soccer in my free time; spent some time in the gym and walked long distances for most of my life. I was not worried about running 10km. I had just moved to Halifax from The Gambia seven months earlier. 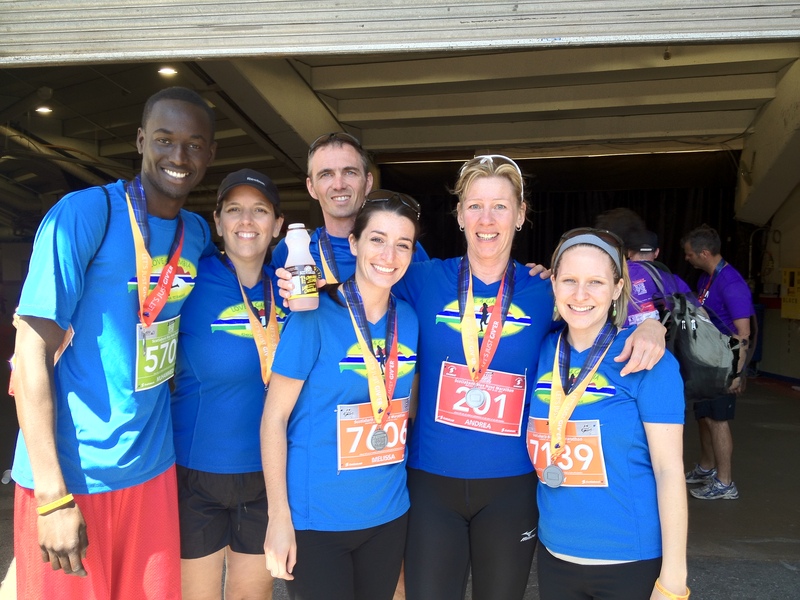 Erin Poirier’s run across The Gambia to raise funds in support of Nova Scotia-Gambia Association‘s (NSGA) health programs was still fresh in my mind. I was motivated to take part in the Blue Nose race weekend to show support for the Love4Gambia campaign. I had just been appointed Executive Director of NSGA in January of 2012. I saw myself as a leader–the face of the organization that has done so much for me and many other Gambians. I was pumped, I was “ready” to go out there and do it! “Training for the 10km run was just going to be a formality”, I remember saying to myself. I had decided to spend the month of February at the gym due to the weather. Running outdoors during my first winter in Canada was going to be suicidal. My first day at the gym was a huge reality check for me. I sure underestimated running 10km or maybe overestimated my abilities to run 10km without any glitches. I planned on running 5km on the treadmill that day, but by the 1st km, I was gasping for air, drenched from head to toe and by 1.5km I couldn’t go any further, so I stopped! Disappointed and humbled by the sudden realization of where my fitness level was, I started to appreciate even more what Erin and team had done for NSGA and The Gambia. For a minute, I tried to convince myself that the kilometer reading on the treadmill wasn’t working properly. As I sat on the treadmill trying to catch my breath, another thought came to me–maybe I should go on the Blue Nose website and de-register myself from the 10km run to the 5km run/walk. I tried to have a sip of water but ended up emptying the whole bottle. I didn’t realize how thirsty I was. I sat there for a few more minutes (maybe more than a few) to gather myself and figure out the best strategy to at least save face from what looks like an embarrassment in the making– I had already told everyone I know that I will be running the 10km race. Then I asked myself, why am I running? Suddenly it occurred to me that it wasn’t about me; it wasn’t about how far or how fast I could run or walk. 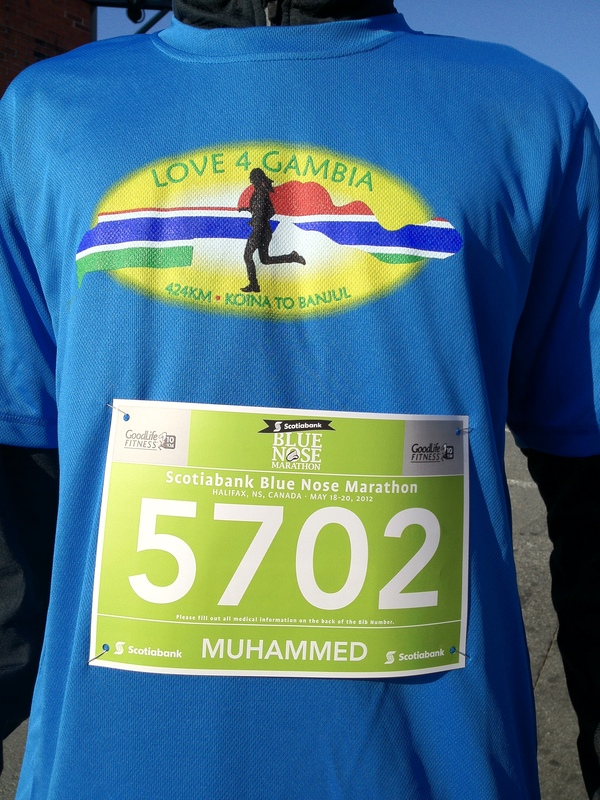 Like Erin Poirier and Andrea Moritz, I had a bigger reason for signing up and running under the Love4Gambia banner. I was running for the children who had a slim chance of living beyond their fifth birthday due to the scourges of malaria; for the young girl going through puberty and not knowing what menstruation was; for the women who have no voice in their communities; for the youth who grow-up with no knowledge of what sexually transmitted infections are and thus perish in the realms of HIV/AIDS; I was running to save lives; I was running for my country, The Gambia. What was important was signing-up, raising funds for team Love4Gambia and running or walking to create awareness and support the cause I believe in. Distance and pace was secondary. With Erin’s help, I had a more realistic training plan, took it easy on myself and enjoyed every moment of my training. It was not always easy but my reasons for running were enough motivation to get me going. A month before the Blue Nose weekend, I was running 12km under an hour every second day. 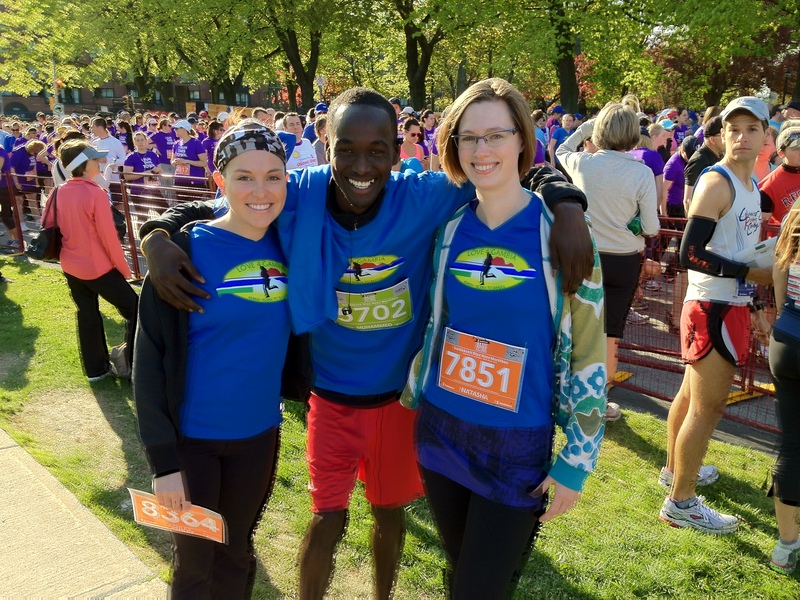 On race day, I was overwhelmed with the number of people who came out to run for NSGA, to run for The Gambia. Most of whom I have never met before and have never been to The Gambia. These Canadians see the world as a global village. They could feel the pain and suffering of the vulnerable children, women and youth we work so hard for. Team Love4Gambia was exceptional. In June this year, Jennifer Pasiciel will be running across The Gambia to raise funds for our programs in The Gambia. I encourage you all to support Jennifer by signing up for Team Love4Gambia in this year’s Blue Nose run. Don’t wait to sign-up. Do it NOW! and start your training. We will be cheering you on at the finish line. You don’t have to be an athlete to support NSGA and team Love4Gambia. It doesn’t matter whether you run the full marathon or walk the 5km. All you need to know is when you sign-up, fundraise and participate on race weekend, you are making a significant difference in the lives of vulnerable people around the world. This entry was posted in Blue Nose Marathon, Charity Team and tagged 10km race, Blue Nose Marathon, charity run, Muhammed Ngallan, training. Bookmark the permalink. That`s the spirit, Muhammed! Great post. Hope lots of people will dare to put one foot in front of the other in support of Love4Gambia!